Welcome home Deputy Sabel! All of us at the Sheriff’s Office wish you a speedy recovery. We always enjoy having visitors come by the station. Photos courtesy of Brady Fulkerson. AMT Streator is ready for the holidays! Photos courtesy of Ryan Zavada. Come see us today in the Pekin Winter Wonderland Parade! Santa Claus also got a new Pekin headquarters this year, courtesy of the Pekin Firefighters. Everyone at Advanced Medical Transport wishes you happy and safe Thanksgiving! Photo courtesy of Kaitlyn Davis. Nicole and Rachel took their intern, Rachel, to visit Santa this weekend. Photo courtesy of Nicole Allen. Dr. Kerns has a compelling story to share about the day he suffered Sudden Cardiac Arrest while at work. His coworkers used CPR and an Advanced Medical Transport Cardio Reviver AED to save his life. During his account, he meets his AMT caregivers for the first time since the incident. AMT has been recognized nationally for its efforts toward winning the battle against cardiac arrest. To learn more, please visit www.amtci.org or call us at 1-800-457-1143. Thank you to Boy Scouts Troop 50 for bringing us our for an ambulance tour, first aid, and CPR instruction! 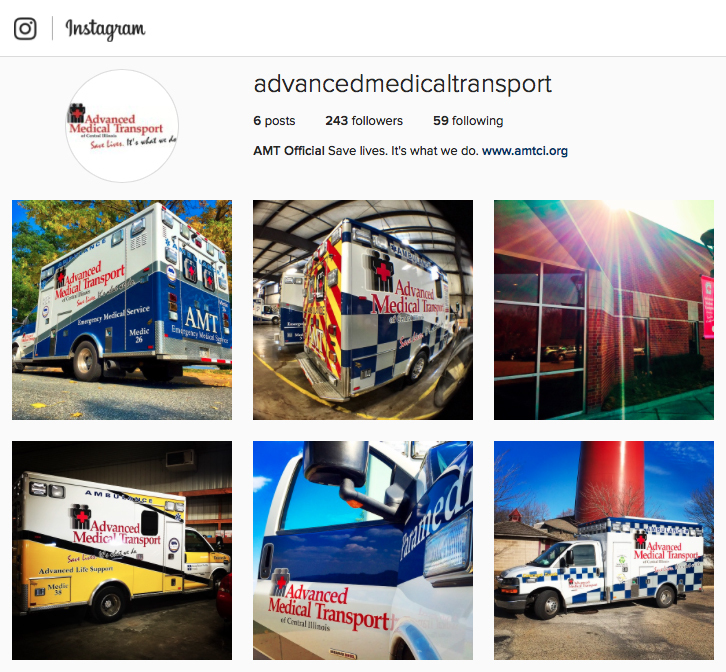 We have many Veterans among our ranks at Advanced Medical Transport. Today, we give them, and all Veterans, an extra special "Thank you" for their service to us all. Of course, our dispatchers have long done this very thing - but do you know how to give compressions in the event of a cardiac arrest? We are happy to show you how! We would like to thank the two Rogy’s locations for asking us to come out for “Celebrating Hometown Heroes” day. Photos courtesy of Tera Vaughn. We have many Veterans among our ranks at Advanced Medical Transport. Today, we give them, and all Veterans, an extra special "Thank you." for their service to us all. We commend the life-saving efforts of these policemen. Officers Mobeck and Schumm went above and beyond and our hats are off to them. High School football season is in full swing, and our Quad Cities crew recently had the chance to meet the Sherrard Tiger. Photo courtesy of Geoffrey Hahn. If you need assistance properly fitting you car seat, please stop by one of the clinics or call and make an appointment to come see a technician. We are here to help! We were overwhelmed by the support shown today at the ribbon cutting for our new Pekin facility. Thank you, everyone! We are gearing up for another BIG day at the GP Career Spark Expo! Photos courtesy of Yolanda Johnson. Our Team reports that they are simultaneously worn out and re-energized by the sheer number of young people who want to learn to Save Lives . #TeamAMT has a bright future! We are meeting more than 3,000 local 8th grade students this week at the Career Spark event. Hopefully, we will inspire some future EMTs and Paramedics. Photo courtesy of Yolanda Johnson. If you see us “waiting in the wings” at local sports events, feel free to stop and say hello. Here, Geoff and Kayla look out over Streator’s homecoming game. Photo courtesy of Geoff Burman. On Paramedic program IV skills lab day, willing subjects are a valuable commodity. Fortunately, our leader, Andrew Rand, was willing to lend a hand. Congratulations to our Customer Service department for meeting their goals. They were treated to a visit from Nacho Mama's Grilled Cheese! Ambulance photo courtesy of Stephanie Sinn. Some of our @TeamAMT members from AMT West made the news! No one is safe from the risk of Sudden Cardiac Arrest. In fact, it's the #1 killer of people over 40 in America. That is why we continue to preach about CPR skills, and continue to place public AED devices. If you would like to learn CPR skills, please reach out to us. We'll teach anyone who is willing to learn. Our entire family’s thoughts and prayers go out to Las Vegas today. Photo courtesy of Brady Gage Fulkerson. CPR is for all ages! Kudos to our own Kelly Walsh for Training 165 eager Girl Scouts. #TeamAMT - let's go bowling! Even better, it is with our brothers and sisters from other public safety entities. Adrian Moreno, Justin Ploog, Tanner Cessna and Mekenna Ewing covered the Quad Cities Marathon providing Medical Standby. Photos courtesy of Justin Ploog. Covered an interesting story today... We don't often think about the stress and trauma that the people who help us on our worst days face as part of their jobs. I took a look at the help available to those who help us. Thanks Josh Bradshaw from Advanced Medical Transport & Jamie Harwood, Peoria County Coroner for being so candid with me about such a personal story for both of you! These children really are Small Wonders, and we sure treasures the opportunity to spend time with them. Some of our own teammates have NICU children themselves. Photos courtesy of Tera Vaughn. We recently got the chance to work through scenarios with the University of Illinois College of Medicine at Quest Academy. Photos courtesy of Keith Lippert. Our friend Jesse Munk was an AMT Paramedic and still does a lot of good deeds in our service areas. We appreciate his efforts in helping keep our local police officers safe and prepared. Learn to save a life! Stop by the Pekin Marigold Festival and we’ll show you how. #TeamAMT supports the Heart of Illinois United Way and it’s programs. In fact, Heart of Illinois 2-1-1 lives under our roof. Those who have visited us may have seen that program in action! Geoffrey Hahn submitted a great unfiltered photo that shows the high visibility of the retroreflective film on our ambulances. The film made its debut on our Concept Trucks. We were privileged once again to be a part of the 2017 Rock Island Grand Prix. Photos courtesy of Zackary Vilmont. A tip of our hat goes to Ameren Illinois for equipping trucks with AEDs! The Road to Recovery The Pekin Police Department is again releasing a series of videos as part of our Pekin Heroin Initiative. This new series is called "The Road to Recovery". We hope that you will take a few minutes to watch these videos and share them. There are so many people affected by the Heroin epidemic in our Country. So many good people and good families find themselves fighting this horrible life gripping and threatening addiction in our community. The first video shows you the process of our Safe Passage Program and Gateway, the journey to sober living. Once again, these videos will feature those directly impacted by addiction and their journey. World Suicide Prevention Day is Sunday, September 10. Let's all watch out for one another and reach out to anyone who might be struggling. We are all in this together. Thanks to Mark Gilles for the link. We will be rooting for our AMT Quackers ducks at the The Center for Prevention of Abuse 29th Annual Duck Race tomorrow! 39 new PulsePoint connected cities in Missouri and Kansas today! Welcome KCK, KCMO and Johnson County dispatch centers. We'd like to say thanks to the PAWS Giving Independence trainers for giving us a chance to meet some very special servants and give them a tour of our ambulances. We enjoy getting submitted photos of our trucks and our crews doing service to the communities, and thank you to all who send them to us! Photo courtesy of Tyler Osborn. Photo courtesy of Angela Glendenning. Have you heard of Mobile Integrated Healthcare? AMT piloted it's program a few years back, and found it to be an overwhelming positive for our patients. It’s a beautiful day to learn CPR skills and get an up close look at an ambulance. Come on out to Northwoods Mall for the back to school health and safety fair! Photos courtesy of Tobey Beagle. Justin Ploog shared some great pictures from the Freedom Run 5K in East Moline. The event was presented by our friends at UnityPoint Health - Quad Cities. AMT family night is in full swing. Come and join the fun. AMT responding to Tailgates and Tallboys. Photo courtesy of Kim Gilles. Carson Smith alerted us to a citizen who is looking to thank her bystander good samaritan helpers. We would like to congratulate Candy Eakman for 25 years (and counting) of service, to the day. Thank you, Candy! Some more Night Out Against Crime fun, courtesy of Denise Durrell and Jacqueline Durham. Calling all Quad Cities and Iowa City EMTs! Join #TeamAMT What did you do today? Make a difference in the community in which you live and join our fast paced team of experienced care givers. AMT is now hiring!